Weekly Series Update The weather gods have not been kind to us. Between light winds and blow-outs, our racing season got off to a slow start this year. Hopefully the weather will settle down and we can get some races in. Wednesday night races are starting at 6:50 pm this year to give everyone an extra 10 minutes to get from work. As usual, we end the day with burgers and dogs, so come on out and join us. We need more people to come out for Sunday afternoon racing. We start at 2:00 pm, race 2 or 3 races and head back in for hot dogs and burgers around 4:30. It’s a great way to enjoy a Sunday afternoon. The sailing is more casual than the Wednesday evening crowd. This is perfect for those of you who want to try racing in a more relaxed atmosphere. Rich Fox sends out race results for completed races and we will soon have interim results posted on the web site both on the main racing page and on the 2017 Racing Series page. Be sure to check weekly for updates. RC Duty Signup Crisis Our RC duty signups have been light. We currently have no one signed up for Sunday Race Committee this weekend or any weekend going forward. And we have no one signed up for Wednesday Race Committee after 5/20/17. We really need people to sign up and take their turn on RC duty. The alternative is for everyone to read up on “rabbit starts.” Go to the RC Signup page to sign up. Mayor’s Cup Update The Mayor’s Cup Regatta is just 3 weeks away on May 20-21. Come out for some great racing, great food, music and beverages. Remember that the Mayor’s Cup party is open to all club members. Just $10 buys you a great BBQ dinner, drinks and dancing. What a deal! Dinner will start at 6:00 on May 20. Race documents and the registration form are posted on our web site under the racing tab. To pre-register, download the registration form and send it in, or send an email to racing@ecsail.org with your boat name, skipper name, sail number and class. Registration is $50. Full meal packages for the weekend are $20 per person and T-shirts are $15. The meal package includes 2 breakfasts, 2 lunches, and 1 dinner, plus drinks. We still need volunteers to help with the regatta. Geoff Endris will be the Principal Race Officer for the regatta and will be running the “on the water” activities. We need 3-4 more volunteers for his RC team including: Safety boat (2 people) Signaler (main RC boat) In addition, we need volunteers to help with the “shore side” activities including: Registration table (Sat morning) Breakfast and lunch hosts (Sat and Sun) Volunteers will receive work credits and this really nifty soft side cooler. Be the envy of all your friends and sign up to volunteer today. No racing experience necessary. Send an email to racing@ecsail.org. 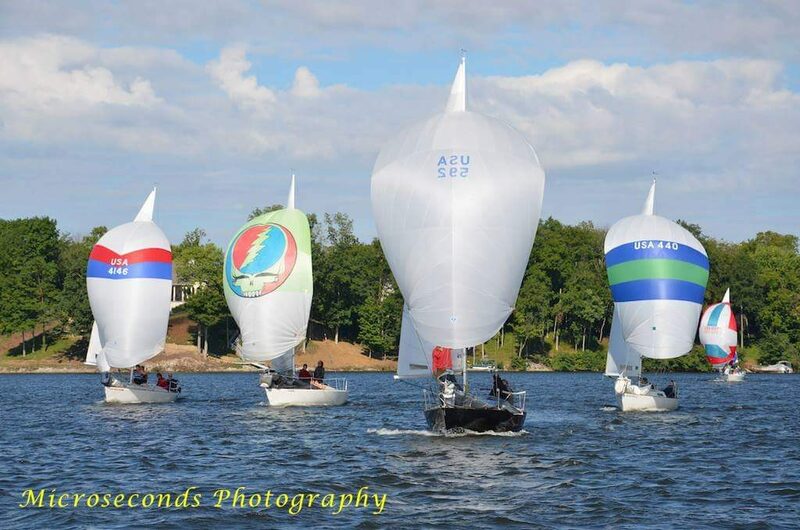 Flying Scot Regatta update June 10-11 is the ECSC Flying Scot Indy Regatta. 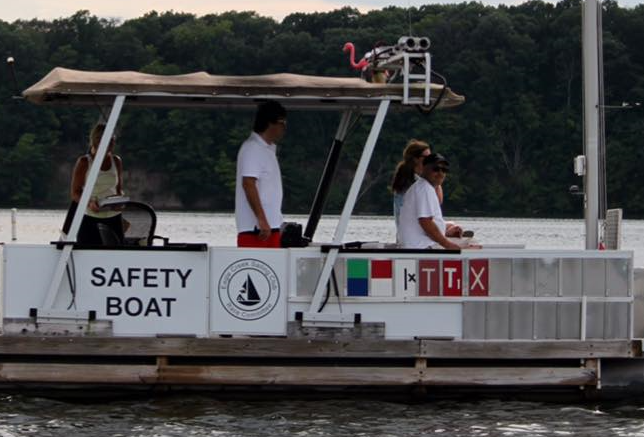 We already have 10 out-of-town boats signed up and will probably have over 15 boats for the regatta. 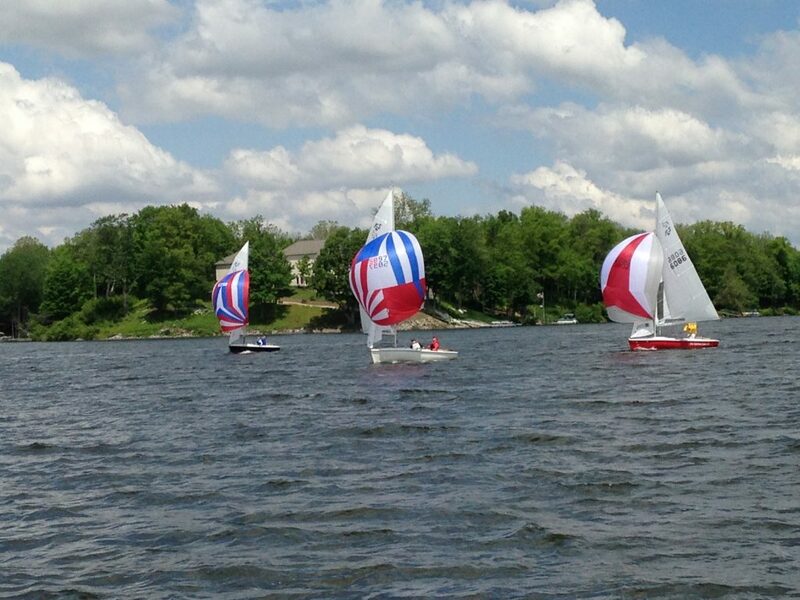 This is part of the Flying Scot Midwest District series with top sailors from around the Midwest coming. This is becoming our most popular regatta for out-of-towners. Tyler and Carrie Andrews will be coming back, so be sure to come out and say “hi.” The highlight of the regatta is the root beer floats on Saturday after racing. Race documents can be found on the web site. For you new Flying Scot owners, come out and meet fellow Scot racers. We have some out of town racers looking for local crew. If you want to crew on an experienced skipper’s boat, send Geoff an email at racing@ecsail.org. Rich Fox will be the Principal Race Officer. He needs volunteers to help run the race. If you are interested, please contact him directly or send an email to racing@ecsail.org. Again, all volunteers will get work credits and the aforementioned nifty soft-sided cooler. We could also use some volunteers to help with the shore-side activities – mainly breakfast and lunch. Hello ECSC Sailors, May is off to a rough and very wet start. My hope is that this bodes well for a dryer and windier summer. Only time will tell. This month I am re-publishing an article submitted by our racing chair, Geoff Endris. It is a retrospective on the Flying Scot on it’s 60th anniversary. The article was written by Debbie Cycotte, the Flying Scot association historian. The Flying Scot, Sandy Douglass’s Crowning Design Achievement, Celebrates 60 Years ~ Debbie Cycotte, FSSA Historian This year the Flying Scot celebrates its 60th anniversary, which seems like a great time to celebrate its designer, Gordon K. Douglass, or Sandy, as he is known to thousands of sailors who own one of his boats. Sandy is considered one of the best small boat helmsmen this country has produced and a brilliant boat designer. He is best known as the designer of three different one-design dinghies, in addition to the 19-foot Flying Scot, he also designed the 17-foot Thistle (launched in 1945, with about 4,000 boats built so far), the 20-foot Highlander (launched in 1951, 1,100 boats built so far). All three classes are boat names that reflect Sandy’s Scottish heritage. Sandy was a colorful, energetic man who lived his life in pursuit of excellence and was unafraid of innovation. He said of himself, “If it can be done, I can do it better.” He brought the concept of a planing hull to the United States and the Thistle, the Highlander and the Flying Scot all reflect that. Sandy believed that the more specialized anything becomes, the fewer people will enjoy it. So his goal was to build boats with a broad appeal, and that included family use. By the time Sandy designed the Flying Scot, he had had 20 years of experience building wooden boats. The Flying Scot was one of the first one-design boats made from fiberglass. Sandy only designed a new boat to fill a void. With the advent of fiberglass, which was lower maintenance than wood and had greater design potential, Sandy now saw a reason to build an attractive alternative to the Lightning. Designing the hull was no problem for Sandy because he had a clear idea of what was needed for a planing family boat. Such a boat should have the safety of wide side decks and also a roomy cockpit. Wide side decks help keep the boat from filling up in a knockdown but leaves little cockpit space. Sandy conceived the idea of having both wide side decks and a roomy cockpit by lowering half of a wide side deck and giving it the shape of a comfortably inclined seat, which provided for a roomy cockpit. He “wondered why no one had thought of this before”? Unfortunately, it turned out that none of the salesmen or engineers of fiberglass who called on Sandy knew much more than he did. Sandy had to teach himself how to build with this new material. Sandy, the gregarious, optimistic and supremely confident and accomplished man he was, stepped right up. Sandy’s goal was to design and manufacture a boat that was well built, but exciting and able to be sailed by a wide range of people, in size, number and skill level. He always felt that a strict one-design boat was in the best interest of all purchasers, past and future, and was the truest test of one’s sailing skill. Advertised as the “culmination of the best features of the other Douglass designs,” the Flying Scot quickly caught the eye of small-boat racers. The Flying Scot is larger, has more beam and is more stable than the Thistle. The prohibition of hiking straps was an effort to make the boat more competitive for smaller-sized people, like Sandy and his wife, Mary, who crewed for him for 30 years. With more than 6,100 boats built and a continuous primary builder throughout its history, the Flying Scot is one of the leading one-design classes in the US. A strong class association ensures strict one-design competitive racing to attract top-caliber sailors. The class also enjoys family camaraderie and teams are often comprised of family members. They are the only one-design class to host a Wife-Husband National Championship each year. There are over 200 active Flying Scot fleets in the US. The Flying Scot was inducted into the American Sailboat Hall of Fame in 1998. ECSC is proud to be registered as fleet 201 with the Flying Scot Sailing Association. We now have 8 Flying Scots at ECSC – 4 of whom plan to actively race their boat. The Scot has an active group of racers who travel throughout the country. It is common to get 15 to 30 boats at a single regatta. Our National Regatta regularly attracts 60 boats per year. 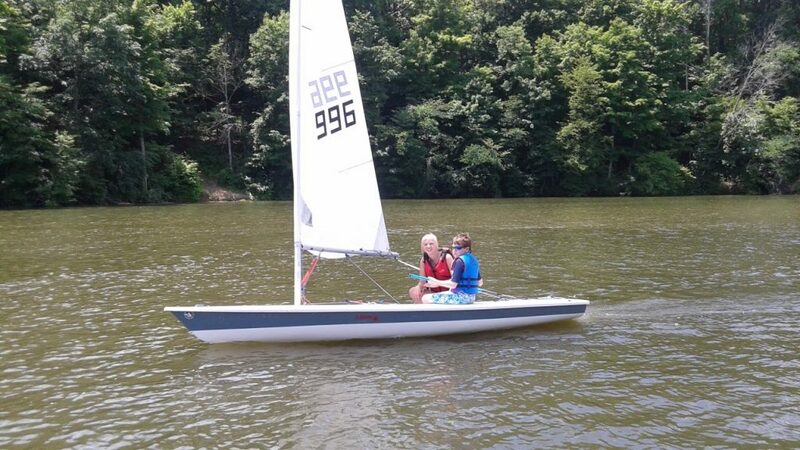 This year, ECSC will host its 4 annual Flying Scot Regatta. We expect at least 15 boats from all over the Midwest. ECSC now has a direct connection to the Flying Scot. Our own Tyler Andrews married Carrie Carpenter, who is the daughter of Harry and Karen Carpenter, the current owners of Flying Scot, Inc. Tyler now works full time at Flying Scot and is having the time of his life selling and sailing Flying Scots all over the country. Tyler and Carrie now compete as a Wife-Husband team.